This is your perfect mountain retreat! How often have you dreamed of owning your own piece of heaven in the mountains of Western North Carolina? Do you find yourself longing for cooler summer days and breathtaking vistas. Do you want that home away from home where you can escape to take in the majestic mountains painted in glorious color, light a fire and cozy up with a plush blanket wrapping you in the warmth of knowing you are in a special place? Well your dream can become a reality when you make this perfect mountain retreat your own! Located in prestigious Highlands Country Club, only minutes from Main Street in Highlands NC, this 4 bedroom and 4 bath home offers everything you could want in a mountain house. Acclaimed Atlanta architect, Norman Askins, completely renovated, expanded and redesigned this jewel in 2002, providing you with a home that is ready for you to make your own. The kitchen features professional gourmet appliances and tumbled marble back splash with Corian counter tops. The dining area leads easily to the top level of extensive western red cedar wrap-around decking to enjoy the beautiful long range views while entertaining your family and friends. If you enjoy entertaining, this home has played the comfortable host to parties of over 100 guests with easy traffic flow and space to move around. For quiet rejuvenation, relax in the spacious living room with a crackling fire in the stone fireplace while taking in the amazing views through the floor to ceiling windows. This is the perfect spot to read a book and curl up with your favorite throw on those cool Highlands evenings. Everything you need is located on the main level of this spacious home including the master bedroom and bath along with an additional guest room with its own bath. When guests come to visit, they will have their own space and privacy while enjoying other guest quarters found on the upper and lower levels of this house. The terrace level of this beautiful home features a media room with seven-speaker surround sound, an office, a bedroom, a workshop room, and wrap-around decking on the ground level. Additionally, this home offers an endless pool (8×13 swim area) with porcelain tile surround and floor in its own room. This extraordinary feature provides you with the ability to take advantage of all the benefits of low impact exercise, aquatic therapy and relaxation in the comfort of your own home. Swim whenever you like on your own schedule at your own perfect pace. No traveling, no crowded pools, no heavy chlorine. Just your own precision engineered swimming pool, where you swim or exercise against a smooth current that’s fully adjustable to any speed or ability. With its small footprint, this pool is easy to maintain and uses minimal resources. This is a smart home and is fully wired for telephone, cable, satellite and internet. 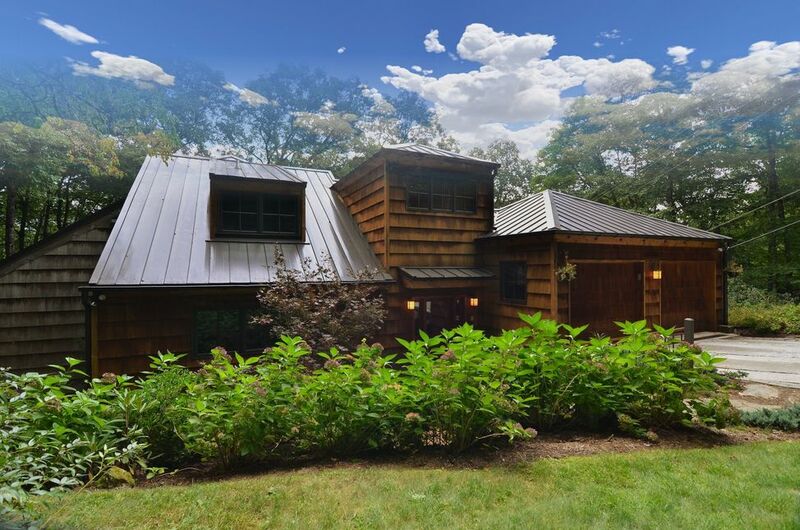 Additional features include undercourse cedar shake siding, standing seam heavy duty metal roofing, whole house 12kw Winco generator, two separately zoned HVAC units for up and down heating and cooling. Low maintenance exterior. Built with finest finishes and craftsmanship throughout.